Last week I dined out at La Bonne Heure, a cozy (read: tiny) organic almost-vegetarian restaurant in the 13th arrondissement. The lighting in the restaurant was quite dim, so the photos I managed to snap of my meal with my iPhone aren’t that impressive. It’s a cute little place with a small staff and a decent menu of vegetarian items. I would have to say this place is NOT really vegan friendly. I ended up ordering a bean chile dish, but no dessert. I was surprised to find a selection of fish on the menu, when I had come there thinking it was a vegetarian restaurant. But at least I’m pretty sure everyone on the menu was organic. 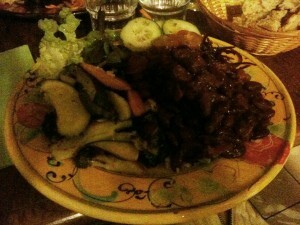 Being a vegan, I don’t think I’d return to La Bonne Heure, but if you’re just looking for an organic meal, it’s not bad. I would advise not going during a heat wave though, as we did, as it’s a small place with no air conditioner, and the kitchen opens up into the dining area.